100 Face Challenge: Studio Cat (#6 & #7)! 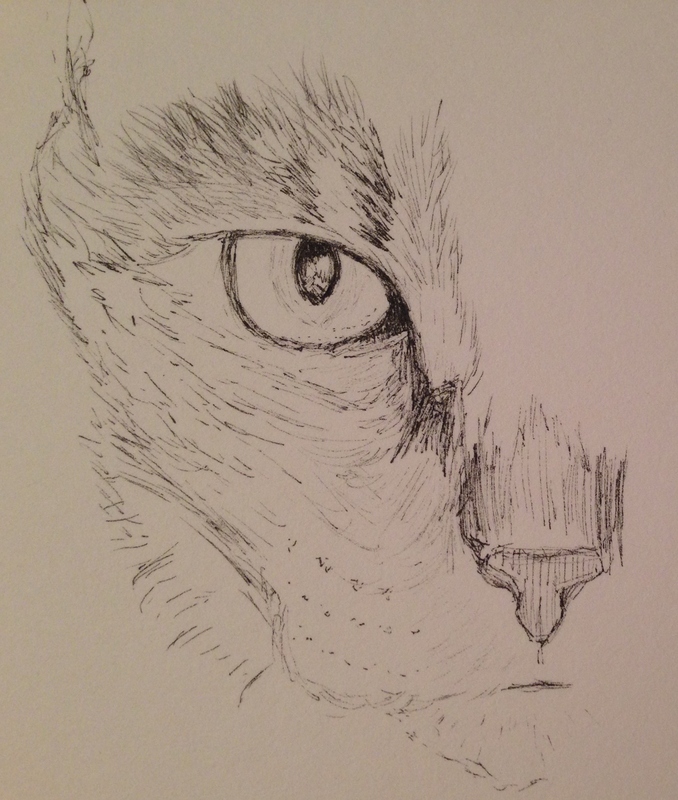 My first attempt was in graphite pencil (2B) in my 65-lb., mostly smooth Canson sketchbook. 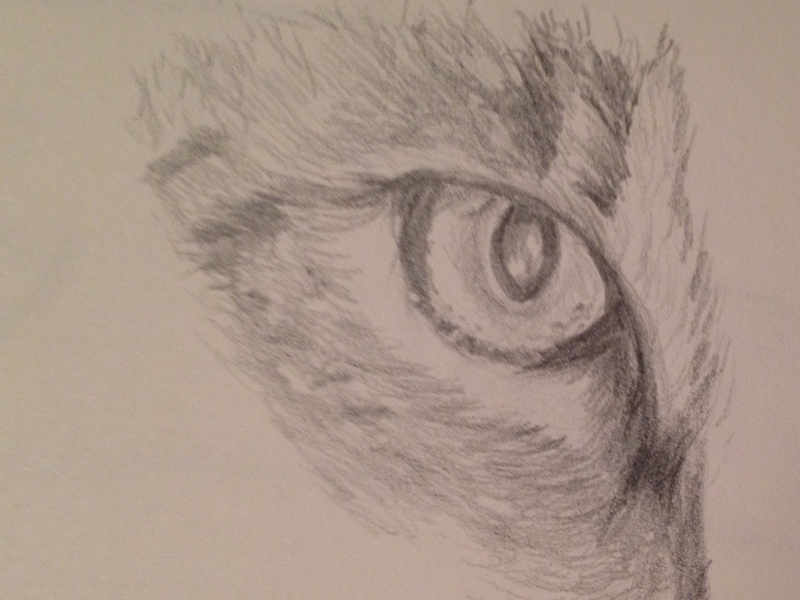 I was happy with the eye, but had misaligned some other markings a bit. And I didn’t think the lightweight paper would fare well with too much erasing. So I tried again in ink, this time in my Strathmore mixed media journal with a Copic 0.1 mm nib. I’ve not finished this drawing, but will probably start over again on Bristol smooth paper. The photo has so much eye detail (making me crave about 100 more just like it, of any animal you please!) and I find myself being drawn to it again and again. I’ve found that the importance of a good photo reference can not be overestimated. I’ve also found that in spite of a good reference, it’s easy to make mistakes. hehe. I’ve got some barnyard animals planned for the future: cows, horses, rabbits, roosters, and even the odd squirrel and raccoon. Also, more dogs! I hope you make this a day to remember. Meowing in public could go a long way toward brightening a January day. (I’m just checking to see if anyone’s still reading. But meowing in public really is fun!) Peace. < 100 Face Challenge: Noah (#5)! MEOW! :))) Nothing quite like a cat eye. Glad you enjoyed it Deborah! Meeeeooooooow! 🐱 Your first sketch reminded me of the LSU LOGO on their football field. Meow meow meow! This is sooooo striking. Bravo! It makes such an impact being only a partial face. Lovvvvvee it Laura! Nicely done. You are good at eyes. And thank you! I hope you’re enjoying January. Has your semester started yet? Next Tuesday. Thanks for asking. I am loving all of your creatures so far!! I’m so glad Carol! I’m a bit odd in that I prefer to own a cat but would rather draw a dog. Hehe! I think it’s the quiet peacefulness I really appreciate about cats. I wouldn’t wanna be awakened with a bark. lol. Meows were bad enough! All animals are wonderful though. I’m glad you’re enjoying my little project. Thank YOU, Sharon, just because you’re awesome. 💛 I’m glad you enjoyed it. I could fall into this cat’s eyes! :)) The photo was just incredible. Cat’s eyes are definitely the coolest. Your studies of the facial features are good. Also trying different papers, ink and pencil. When you do small studies of features there is less commitment than say a full portrait of the face. This is where you can push yourself to try different options. The eyes have it! Or you as the case may be. 🙂 Excellent. Ooh, good one. I’ve done two owl eyes but it’s been many moons ago. And they were so much fun to do. Talk about being mesmerized. Aw thanks, Tori. I find cats more challenging, but have drawn more dogs, for sure. I’m partial to cats as pets. There’s nothing like the soft purr and quiet warmth of a cat. 💛 I’m glad you’re enjoying my drawings. That means a lot, as I admire your work so much! I was thinking about you and your building challenge the other day. Interesting and it works …. did anyone say purfect? Laura, you absolutely amaze me! Every time I see a post of yours, I can’t believe you’ve only been drawing for a bit over a year. You really are talented! Wow, Teresa, that’s the nicest thing I’ve heard in a long while! You and the rays of sunshine following you around have been missed, my friend! Oh you crack me up! Great eye!!! Thanks, Catherine! Meowwww to you! Glad you enjoyed! What wonderfully intense, prowling eyes you’ve achieved, Laura – the partial aspect really gives a powerful atmosphere. Awesome! Thanks so much, Jacob, and thanks for the follow! I’m really enjoying partial faces right now. This cat’s eyes are amazing in the photo. I couldn’t resist them! I’m so glad you enjoyed this! That’s a huge compliment as I just spotted a gorgeous wolf over at your place. A really wow piece! I’m complimented by your follow. Thanks again. You’re so welcome! Awesome work! And thanks so much for your comments on wolfy. He was great fun to draw.